Democrats Have an Edge With Independents. Will It Grow? Independents’ top voting concerns ahead of the 2018 midterms are the economy and health care. Polling suggests Trump could be more of a drag with swing voters than a boon. 51 percent of undecided independents say they’re leaning toward voting GOP. Sharp partisan disagreement over nearly every policy and current event issue since President Donald Trump took office has helped spark high turnout levels from both Democrats and Republicans in recent special elections and primaries, compared with the 2014 midterm elections. With partisans energized to vote, independents may well make the difference in which party controls the House and Senate in 2019. As nonpartisan political analyst Stuart Rothenberg wrote earlier this year in Roll Call, independents have proven decisive in the past three wave elections, opting for Republicans over Democrats in 2014 and 2010 by respective 12 and 18 percentage point margins and backing Democrats over the GOP by 18 points in 2006, helping both parties achieve House or Senate majorities. The inaugural edition of Morning Consult’s deep dive into independent voters, based on a July 16-18 survey of 936 respondents, shows Democrats holding an 8 point edge over the GOP on the generic ballot — a positive sign as the party seeks to pick up 23 House seats and flip two Senate seats to take the reins in both chambers. However, a plurality of independents (40 percent) remain undecided on whether they’d vote for a Republican or a Democrat if the midterms were held today. And when those voters were asked which way they were leaning, the differences were negligible between Washington’s ruling GOP (51 percent) and the Democrats (49 percent) — within the poll’s 3 point margin of error. “Large swaths of undecided and independent voters are certainly not itching to vote for the party of Donald Trump this cycle,” Eric Ostermeier, a research fellow at the University of Minnesota’s Humphrey School of Public Affairs, said in an email last month. “But they are nonetheless also having difficulty buying into the Democratic brand and supporting their candidates – especially when the loudest Democratic voices populate the far left or progressive wings of the party,” he added. The survey hints that Democrats may have a turnout advantage among independents: Seventy percent of those who said they voted for Democratic nominee Hillary Clinton for president in 2016 said they were “very motivated” to vote in November, versus 56 percent of independents who voted for Trump. 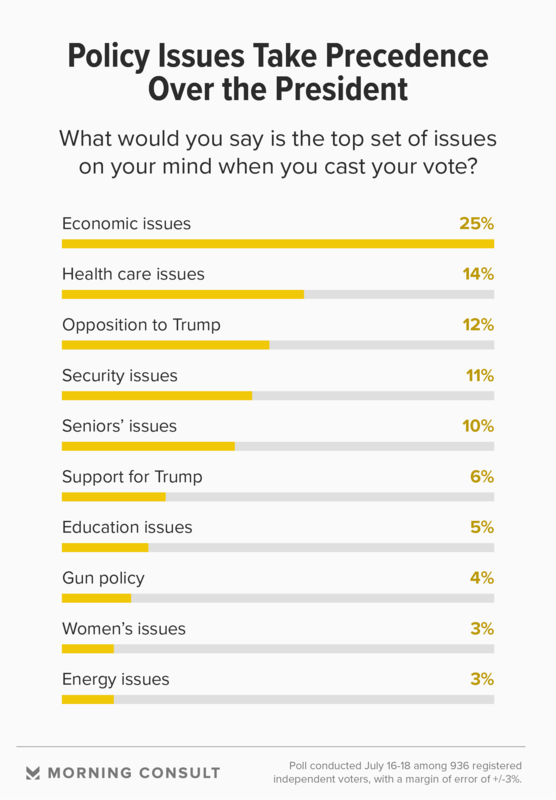 While polling shows Trump to be a prominent influence on partisans’ voting motivation, a significant share of independents are prioritizing “kitchen table issues” such as the economy and health care. In the survey, a quarter of respondents said the economy was their top issue when it came to how they plan to vote in November, followed by 14 percent who opted for health care. But on specific concerns, independents who prioritized the economic issues were more likely to resemble the average Republican voter than the average Democrat. Respondents were asked to pick which economic issue was most important to them: jobs, wages and unemployment, government spending or taxes. Fifty-six percent of independents picked the first option, closer to the 46 percent of GOP voters who said the same in a recent survey than the 73 percent of Democrats who voiced that preference. And the quarter of independents who picked government spending matched the percentage of Republicans who said the same, versus 11 percent of Democrats. The differing focus may go some way to explaining why independents in the survey were 10 points more likely to say they trusted Republicans over Democrats in Congress to handle economic issues. Throughout the year, GOP leaders have devoted much of their prepared remarks at press conferences to touting the party’s record on the economy, citing higher confidence levels from the business community and their signature legislative achievement, the Tax Cuts and Jobs Act of 2017. Following the GOP’s aborted plan to repeal and replace the Affordable Care Act, party leaders are spending comparatively less time discussing health care. That may be a wise choice, as independents say they trust Democrats over Republicans on the issue by a 17-point margin. And while independents cared less about the president as a voting issue, it appears Trump may be more of an electoral drag than a boost in November: Twelve percent said opposition to the president was their top priority — twice the number who said they’d value a candidate’s support for the commander in chief.